Vascular compression syndrome is a topic of both interest and controversy. There is a gamut of such processes in abdomen and pelvis which have characteristic imaging appearances. Computed tomography scan with contrast is the imaging modality of choice. Since such syndromes are frequently encountered in asymptomatic patients as well, precautious diagnosis has to be made strongly considering the relevant clinical history and deciphering the specific imaging features that would suggest the grave side of the pathology. This pictorial essay will address the clinical and imaging features of abdominal and pelvic vascular compression syndromes with relevant teaching points. Vascular compression syndrome is a topic of both interest and controversy. There is a group of such processes in abdomen and pelvis which have characteristic imaging appearances. Computed tomography (CT) scan with contrast is the imaging modality of choice with some conditions requiring Doppler ultrasonography or digital subtraction angiography for confirmation and treatment purposes. These conditions are frequently encountered in asymptomatic patients as well, requiring precautious diagnosis strongly considering the relevant clinical history. Radiologists should be aware of the specific imaging features and clinical scenarios that would suggest the grave side of the pathology. 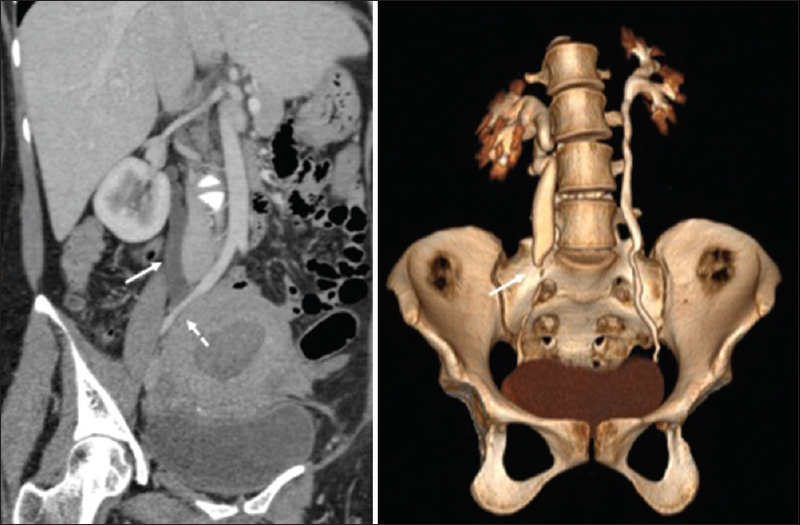 This pictorial essay will address the clinical and imaging features of abdominal and pelvic vascular compression syndromes with relevant teaching points. The right and the left crura of the diaphragm form an arch-like fibrous band – the median arcuate ligament (MAL) [Figure 1]. When the ligament is low or thick or shows aberrant insertion, it can compress the celiac axis or celiac ganglion resulting in symptoms which are typically postprandial pain in the epigastric region and weight loss. 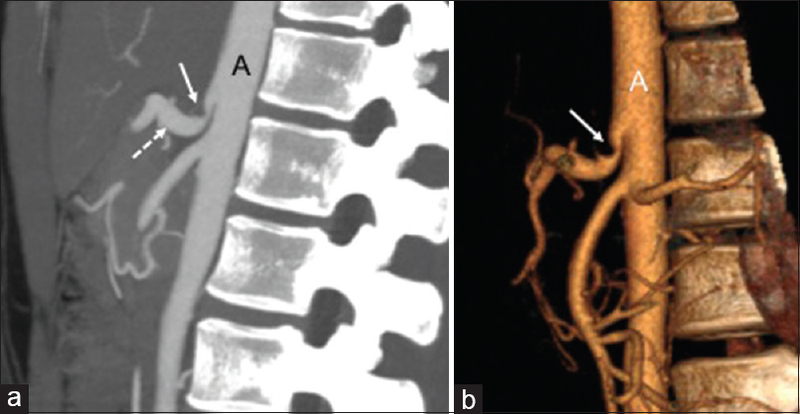 Imaging features include characteristic “fishhook” sign of the celiac artery on sagittal CT angiography [Figure 2]., The compression increases during expiration and can be appreciated on conventional angiography. Dynamic changes in velocities of the celiac artery can be assessed in inspiration, expiration, and in erect positions on Doppler ultrasound, which provides the exact hemodynamic compromise otherwise not achievable on CT angiography. MAL indenting celiac artery has a 33% cadaveric incidence and is commonly seen (15%–50%) in asymptomatic individuals. Management is controversial and includes celiac artery decompression, angioplasty, or stenting. Pearl: Presence of celiac axis compression when accompanied by poststenotic dilatation and collateral formation along with favoring clinical history mandates documentation in the radiology report. No significance if only indentation is seen. Superior mesentric artery (SMA) arises from the aorta anteriorly at L2 level forming a normal angle of ~38°–56°. Reduction (acuteness) in the angle results in compression of the third part of duodenum. Such occurrence is due to sudden weight loss or postspinal surgeries resulting in loss of fat around the duodenum/displacement of the vessel respectively and has a strong female predilection. In cases of duodenal compression, patients can present with postprandial pain, nausea, and bilious vomiting with typical reduction of symptoms on prone or decubitus positions. 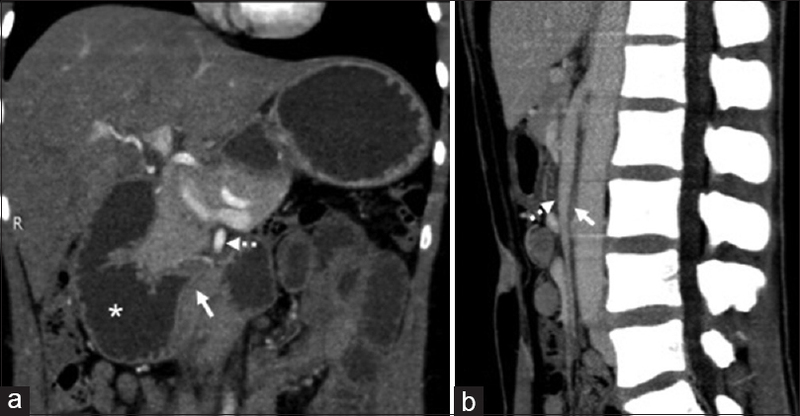 With adequate clinical history and presence of dilated stomach/proximal duodenum and aortic-SMA angle <22°, a diagnosis of SMA syndrome can be made [Figure 3]. Another criterion is aortomesentric distance <8 mm., Management includes normalization of weight and nasogastric tube aspiration. Duodenojejunostomy is considered in failed conservative management. Pearl: Diagnosis of SMA syndrome should always be made with caution and after careful exclusion of other more common causes of duodenal obstruction such as mass, stricture, and annular pancreas. 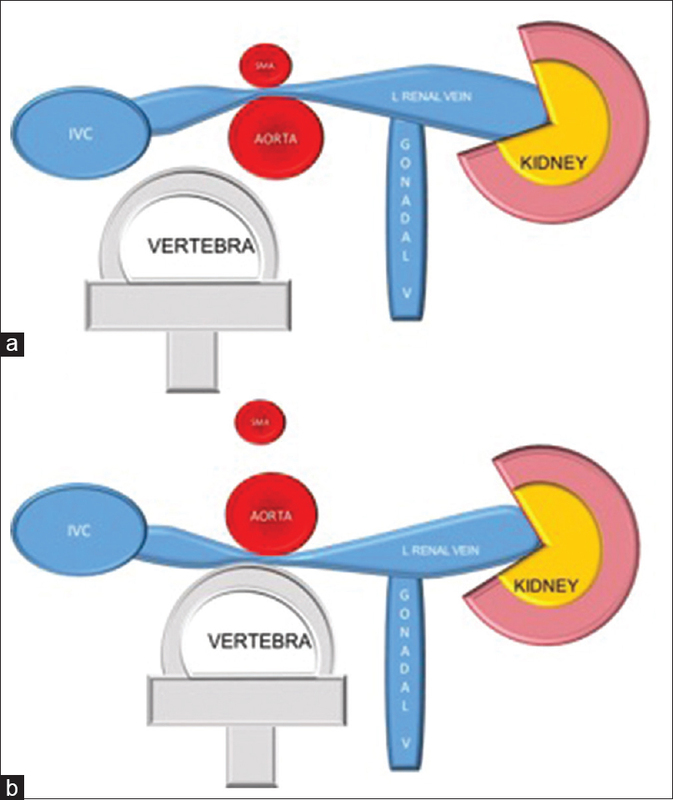 Reduced SMA-aortic angle can also cause chronic compression of the left renal vein (LRV) resulting in renal venous hypertension, which causes hematuria or gonadal vein congestion (varicocele in males and chronic pelvic pain in females) [Figure 4] and [Figure 5]. Imaging criteria include abrupt narrowing of LRV between aorta and SMA, ratio of LRV at hilum and at narrowing >4.9, presence of collaterals, unilateral pelvic varices, or varicocele. A pressure gradient of 3 mmHg between the renal vein and inferior vena cava aids in diagnosis. There is an entity called “posterior nutcracker,” wherein there is compression of retroaortic LRV between the aorta and vertebral body. Asymptomatic compression can be present (nutcracker physiology) and diagnosis should be based on strong clinical symptoms. Most are managed conservatively. Surgical options include venous bypass and transposition. Stenting of LRV is controversial. Pearl: Presence of normochromic normocytic red blood cells in urine not explained by any other abnormality should raise a suspicion of renal vein hypertension. Presence of varices is a strong indicator of long-standing compression. Renal pelvicalyceal system and ureter can be compressed by a gamut of vessels, normal, accessory, or aberrant., Normally coursing vessels can result in compression as in retrocaval ureter, compression by gonadal vessels and by iliac vessels [Figure 6], [Figure 7], [Figure 8]. Accessory renal artery or vein can cause obstruction at pelviureteric junction (PUJ) resulting in hydronephrosis. Fraley syndrome refers to compression of superior infundibulum by crossing vessel resulting in symptoms. Persistence of hydronephrosis is the determining factor for management in all these cases. Treatment includes pyeloplasty or pyelotomy for PUJ obstruction and reconstructive anastomoses of ureter for retrocaval ureter. Pearl: Crossing vessels without compression still needs to be conveyed to the surgeon, especially for cases planned for endoscopic procedures (such as ureteroscopy). It is imperative to rule out other sinister causes of obstruction before calling it purely vessel related. Formation of thrombosis within a vessel requires any of the three factors (Virchow's triad) namely hypercoagulability, endothelial injury, and vascular stasis. In May–Thurner syndrome, there is compression of left common iliac vein by right common iliac artery against lumbar vertebra leading to both vascular stasis and endothelial injury, resulting in venous thrombosis. This syndrome has a predilection for young and middle-aged women [Figure 9]. Patients with acute venous thrombosis present with painful left-leg swelling. Incidence of thrombosis is ~0.1%. A difference of 2 mmHg at rest across stenosis with flow reversal, collaterals can be seen on venography. Treatment options are no different from any venous thrombosis management and include percutaneous thrombolysis, balloon dilatation, and or stent placement. Pearl: Compression (>50%) can be seen in asymptomatic individuals (May–Thurner physiology) with cadaveric incidence of 20%–30%. This does not warrant any treatment or prophylaxis. Common bile duct compression and narrowing can occur secondary to para and epicholedochal collaterals in portal hypertension or extrahepatic portal vein obstruction. The former are larger and cause extrinsic compression of the bile duct, while the latter are tiny and intramural. Compression is either due to direct extrinsic effect by collaterals or by peribiliary fibrosis. Majority of patients are asymptomatic with ~5%–30% presenting with obstructive jaundice. 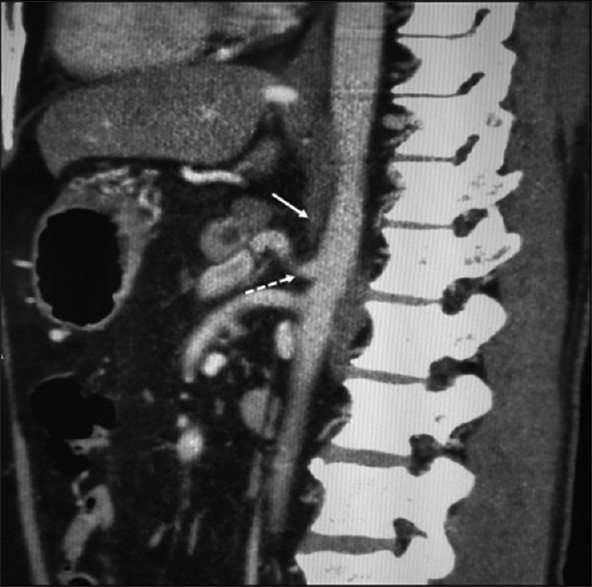 Imaging features include enhancing vessels surrounding the bile duct on CT venous phase [Figure 10]. Magnetic resonance cholangiopancreatography shows multifocal smooth extrinsic compression of bile duct (beaded appearance). Management is usually conservative, with severe cases requiring endoscopic dilatation or stent placement. Pearl: Presence of dilated intrahepatic biliary radicles with clinical and laboratory evidence of obstructive jaundice favors a diagnosis of portal biliopathy. Endoscopic procedures require utmost caution due to the close proximity of collateral vessels which may bleed and result in hemobilia. Vascular compression syndromes are a group of unique conditions wherein a diagnosis is to be made in the presence of strong clinical suspicion or characteristic imaging features that indicate severity. Lamba R, Tanner DT, Sekhon S, McGahan JP, Corwin MT, Lall CG, et al. 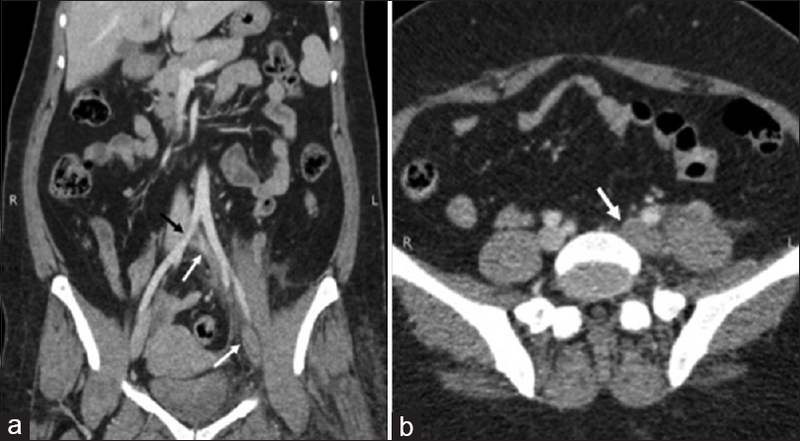 Multidetector CT of vascular compression syndromes in the abdomen and pelvis. Radiographics 2014;34:93-115. Horton KM, Talamini MA, Fishman EK. Median arcuate ligament syndrome: Evaluation with CT angiography. Radiographics 2005;25:1177-82. Tembey RA, Bajaj AS, Wagle PK, Ansari AS. Real-time ultrasound: Key factor in identifying celiac artery compression syndrome. Indian J Radiol Imaging 2015;25:202-5. Rabie ME, Ogunbiyi O, Al Qahtani AS, Taha SB, El Hadad A, El Hakeem I, et al. 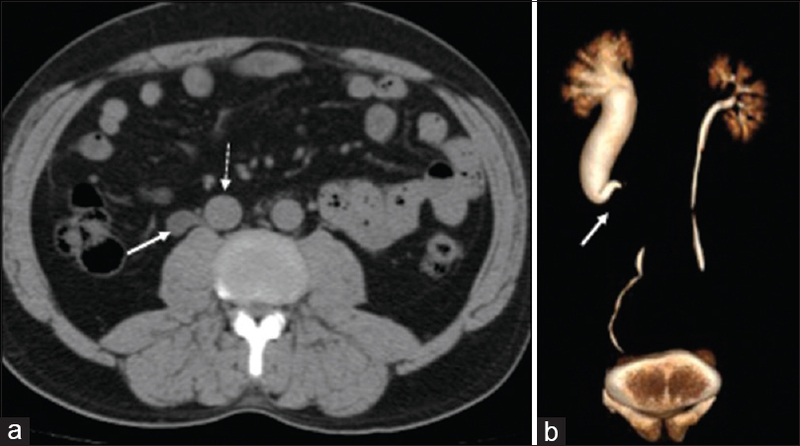 Superior mesenteric artery syndrome: Clinical and radiological considerations. Surg Res Pract 2015;2015:628705. Bhagirath Desai A, Sandeep Shah D, Jagat Bhatt C, Umesh Vaishnav K, Salvi B. Measurement of the distance and angle between the aorta and superior mesenteric artery on CT scan: Values in Indian population in different BMI categories. Indian J Surg 2015;77:614-7. Kurklinsky AK, Rooke TW. Nutcracker phenomenon and nutcracker syndrome. Mayo Clin Proc 2010;85:552-9. Srisajjakul S, Prapaisilp P, Bangchokdee S. Imaging features of vascular compression in abdomen: Fantasy, phenomenon, or true syndrome. Indian J Radiol Imaging 2017;27:216-24. Park BS, Jeong TK, Ma SK, Kim SW, Kim NH, Choi KC, et al. Hydronephrosis by an aberrant renal artery: A case report. Korean J Intern Med 2003;18:57-60. Wu WL, Tzeng WS, Wu RH, Tsai WL, Chen MC, Lin PC, et al. Comprehensive MDCT evaluation of patients with suspected May-Thurner syndrome. AJR Am J Roentgenol 2012;199:W638-45.